Celebrating 61 years of marriage are Roger and Joyce (Mosher) Fisk of Sand Lake. 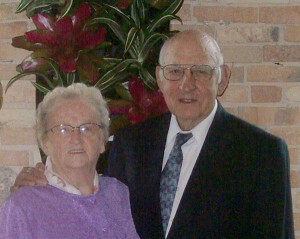 The two were married May 7, 1955 in the Free Methodist Church in Cedar Springs, L.D. Nickleson officiating. They have been blessed with one daughter and five sons; Denna (Randy) Moe, Gregory (Cheryl), David (deceased), Mark, Rick (Cindy), Bruce (Rebecca); 11 grandchildren and 12 great-grandchildren. Roger and Joyce reside on their 4th generation family farm west of Sand Lake. The secret of their success: Working as partners in friendship and love.